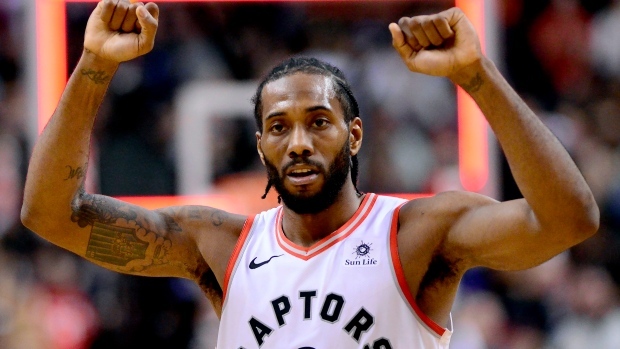 TORONTO – Behind the scenes, many Toronto Raptors officials have become increasingly confident in the team’s chances of re-signing Kawhi Leonard this summer, sources tell TSN. The Los Angeles Clippers are expected to make the most aggressive push for Leonard, and they’ve made little secret of it. The Clippers have had representatives at many Raptors games this season, home and away, ranging from scouts, to assistant general manager Mark Hughes – who attended Friday’s game against Oklahoma City – to team president Lawrence Frank and billionaire owner Steve Ballmer. The Clippers – like the Lakers, who some league insiders believe to be less of a draw to Leonard – can offer at least a few things Toronto can’t. They can offer a warmer climate and an opportunity for the California native to play closer to home. If those are the factors that end up powering Leonard’s decision, the Raptors don’t stand a chance and likely never did. However, as they’ve gotten to know Leonard better, they have come to understand the other priorities that drive him on daily basis. That’s what their pitch will centre on: trust, familiarity, a commitment to maintaining his health and the shared goal of chasing a championship, as well as the extra year and contract worth nearly $50 million more than anyone else can offer. Winning is undoubtedly important to Leonard, and it’s quite clear regular-season victories aren’t what he’s after. To that point, how the Raptors fare over the coming months could go a long way in strengthening or weakening their bid. If they’re playing into June, they’ll have a pretty compelling case to make in the room with Leonard a few weeks later. Conversely, if they flameout in early-May that pitch becomes a lot tougher to sell. One thing they can fall back on, and perhaps their biggest advantage over the Clippers or any other interested team, is their nearly 12-month head start at earning his trust. When Raptors management, led by president Masai Ujiri and GM Bobby Webster, first sat down with Leonard shortly after they had acquired the all-star forward in last July’s blockbuster trade with San Antonio, they wanted to know what he valued most. His answer was the same as he gave on media day months later: he wants to have a long and healthy NBA career. Load management was born. After a mysterious quad injury cost him all but nine games with the Spurs last season, Leonard has only appeared in 54 of Toronto’s 74 games this season and 14 of the 20 he’s missed have been for rest. It’s an unprecedented approach for a team to take with a star in his prime. Naturally, it’s also a polarizing one. Even some inside the organization have been skeptical, according to team sources. They may not agree with it entirely, but they’ve all accepted it, understanding why it’s such a crucial part of achieving their common goal. In order to reach the Finals this spring they need Leonard at or close to his best. In order to be a perennial contender in the years to come they need to retain Leonard. In order to retain Leonard they need to make and keep him happy. That’s been the mandate from up top ever since the moment training camp opened in the fall. That extends to how they’ve managed his workload. He and Toronto’s highly regarded medical staff, led by director of sports science Alex McKechnie, are in constant communication over his health. They run regular tests, give him treatment and work together to determine when he plays and when he sits. If he feels like he needs a night off, they give him a night off. When he felt like he was hitting a wall in January, they gave him a week off. “[The medical staff] lives with him on a day-to-day basis and if things don’t quite feel right or he doesn’t want to push it then we’re completely fine because we understand what his load is, we understand how much he’s working,” Webster said as a guest on TSN Radio back in February. “Just for you guys and the fans to know, sometimes when he doesn’t play it doesn’t mean he’s not working. He’s doing different things in the back and with our training staff to prepare for our next game. That hasn’t gone unnoticed or unappreciated. “We’ll see how it goes moving forward, but me missing games isn’t just to keep me fresh,” Leonard said after Friday’s loss to Oklahoma City, his most detailed account of load management to date. “It’s [about] making sure I don’t re-injure something that I was out for last year. Like I said before, they’ve been doing a good job of reading images and making sure that I’m improving instead of declining on the health side. Leonard isn’t the most emotionally expressive person and can therefore be hard to read. However, those who know him and have been around him for years say that he’s looking more and more comfortable with his new surroundings as the season has gone on. Even to this day, not a lot is known about the sudden and private falling out between Leonard and the Spurs. Their dispute is believed to have centred on the severity and treatment of his injury and went from bad to worse when the team revealed he had been cleared to play but was seeking a second opinion. From there, it’s said that Leonard and his camp lost trust in the organization. The Raptors have been especially cautious not to make the same mistake, keeping his medical information and the inner-workings of load management close to the vest, while making his continued well-being their top priority. That may be an overlooked factor in the decision Leonard will have to make this summer. The Clippers can offer weather and proximity to family and friends. The Raptors can offer more money and a longer term, which could be an interesting bargaining chip if Leonard isn’t fully confident in his long-term durability. Each team will pitch their plan to build a championship contender around him. But could his familiarity with McKechnie and Toronto’s medical staff, as well as the foundation they’ve set with load management, tip the scale? What they’ve done, at least indirectly, is create a model with which to optimally manage Leonard – his workload, comfort level and happiness – and there’s nothing stopping another team from adopting it as part of their own sales pitch. Could the Clippers promise to cap Leonard at 60-65 games? Of course. Can they actually deliver? That’s a different story. LeBron James’ lottery-bound Lakers are the perfect example of what can happen when a star player misses 20 games in the crowded Western Conference. Not only have the Raptors proven that they’re willing to give Leonard a quarter of the regular season off, they’ve shown they have the talent (and are in the conference) capable of withstanding it. The Raptors should go into the playoffs with the East’s second seed, thanks in large part to their 15-5 record without Leonard in the lineup. That’s one of the reasons why Ujiri and Webster felt comfortable taking the calculated risk of trading the face of their franchise, DeMar DeRozan, for a disgruntled star coming off a serious injury and going into the final season of his deal. It’s one thing to tell a player what you and your organization have to offer, but it’s another to spend a year showing them. The Thunder drafted the blueprint last year – rolling the dice to acquire Paul George, another California kid who seemed destined for the Los Angeles. Few expected George to stay in Oklahoma City, without even granting the Lakers a meeting. As it turned out, 12 months is more than enough time to recruit a player when you have him in your gym every day, especially if you’re confident in your team’s culture. The odds are stacked against them, at least that's the perception around the league, but they like their chances.